The Iolite Project Management Software is a powerful tool to manage the Project carried out by your team in various areas very efficiently. Informative Dash board with due work alerts / notifications for pending submission & deadlines, hearing scheduler calendar, personal diary. Powerful tool for creating and managing the inward and outward of documents on case and client basis. A centralized Project docketing repository displaying all documents with specific names & dates under various categories. Complete processing, storage and retrieval of project details and document along with project milestone history making the work flow of law firms highly simplified, productive and smooth. Generates preformatted letters as auto reminders which are send to concerned staff / clients as reminders for pending deadlines & submission. Manages all the clients and prospective clients’ inquiry in just few clicks. View comprehensive case information on a single page. Manage your billing slips for hourly / fix charges applicable against the task carried out for your client and at the same time also store the expense slips of expenses incurred. Facility to convert the billing slip generate by staff into invoices just with few clicks making the task very simple and easy. Generate Pro Forma Invoice, Invoice, Debit Notes and Credit Notes using preformatted templates & record receipts against them. The outlook plugin extension allows users to docket emails and attachments from the outlook directly into the case dockets. 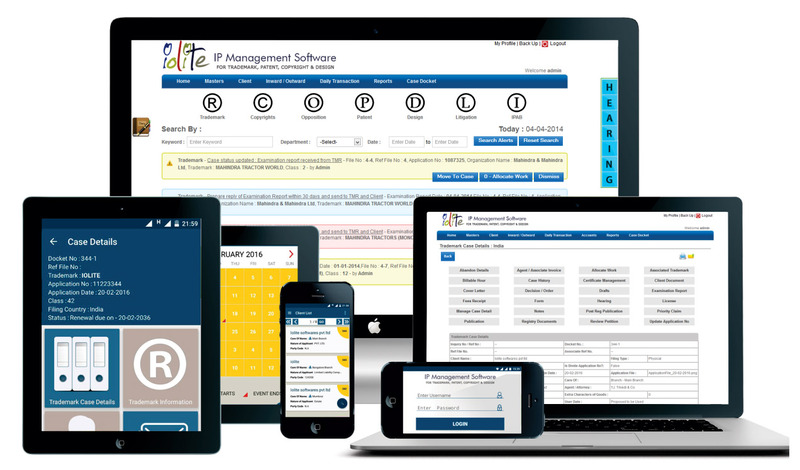 Iolite IPMS Mobile App provides the facility to IP Attorneys to carry out all day to day activities of the Intellectual Asset Management featuring Dashboard, Diary, Hearing Calendar, Client Details and Documents, Work Alerts, Case Details and Documents to be accessed and managed with ease and accuracy, via their smart phones and tablets, saving a lot of time.